As weddings go, it was chock-full of tradition. A bride resplendent in her white gown, personalized vows, angel-faced flower girls and a groom fighting back tears. 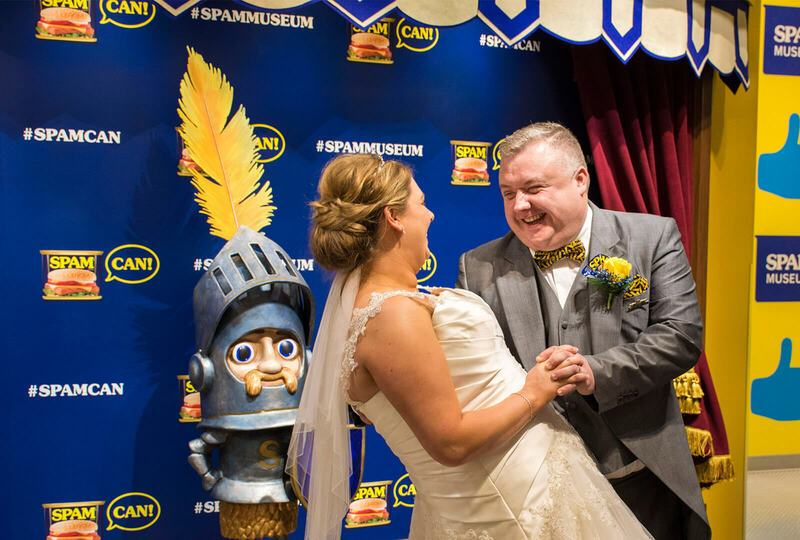 The fact that the new husband and wife tied the knot in the SPAM® Museum in Austin, Minn., and that the groom’s middle name happens to be “I Love Spam” were among the elements that caused the union to morph from the stuff that dreams are made of to the stuff that news is made of. 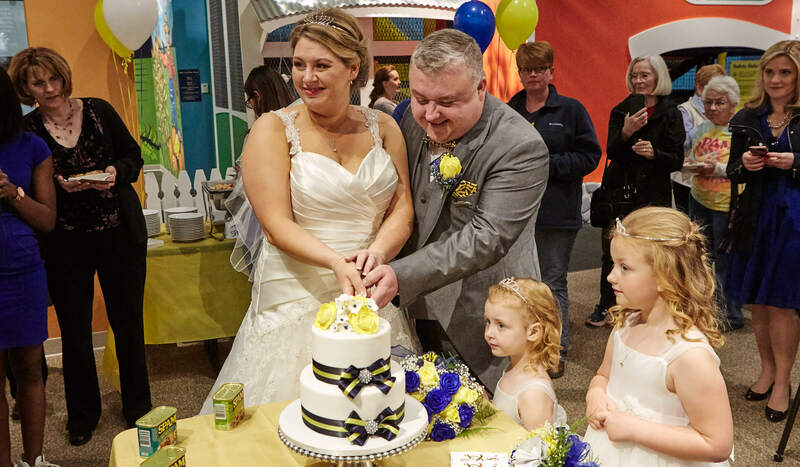 “It was a fun little wedding that we had,” says Savile Lord, the museum’s curator and of late, resident wedding planner. 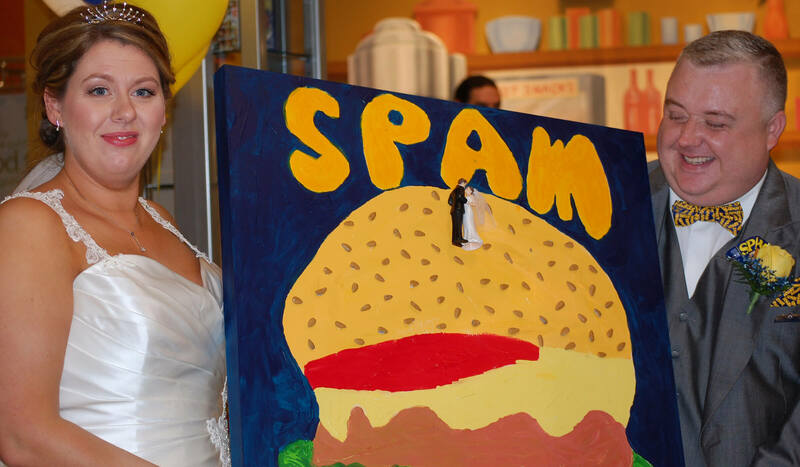 A newlywed in her own right, Savile tended to the invitations, flowers, catering and myriad other details that gave Mark ‘I Love Spam’ Benson and Anne Mousley from Liverpool, England, a one-of-a-kind destination wedding. Mark & Anne ‘I Love SPAM’ Benson cutting their wedding cake. 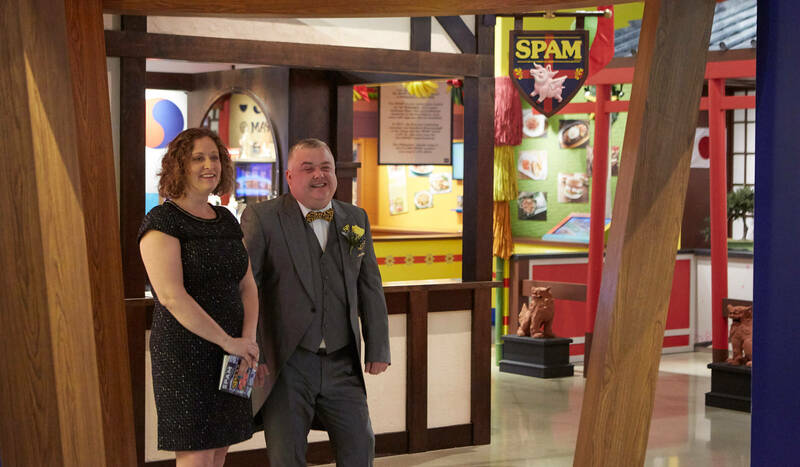 Mark & Anne ‘I Love SPAM’ Benson wed at the SPAM® Museum. This painting was a gift to the couple from a California elementary school class. It arrived during the ceremony. 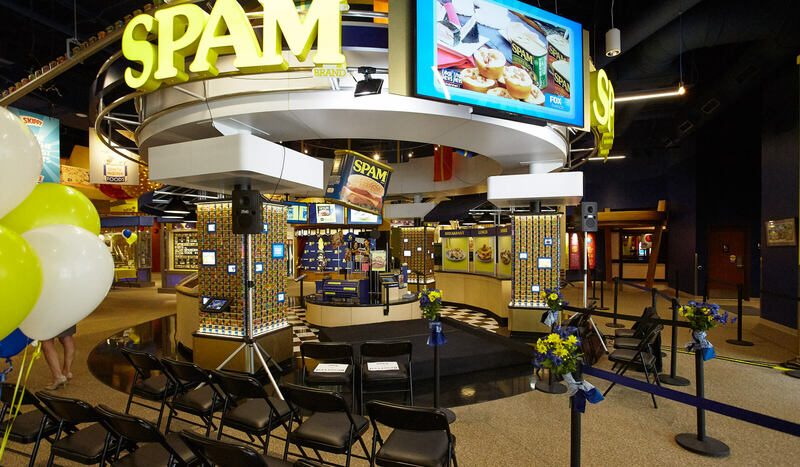 “It seemed like such a natural thing,” says Jaynee Sherman, the senior brand manager who oversees the SPAM® brand for Hormel Foods International and served as the “SPAMinister™” at the ceremony. The SPAM® brand United Kingdom team has had a relationship with Mark for several years. That’s when he legally changed his middle name from William to “I Love Spam,” a request that needed the approval of Queen Elizabeth II. The move got the team thinking. “We were able to capitalize on his name change,” Jaynee says. As the story garnered media attention, Mark was well on his way to becoming a SPAMbassador™, and Hormel Foods was “forming a really nice relationship with an amazing consumer of the SPAM® brand,” she adds. Mark’s affection for the SPAM® brand is nearly as old as he is. From the time Mark was 2, his grandfather, Thomas Farrell, recounted stories of being served the meat when he was a soldier in World War II. The iconic brand was still in its early days, but proved its mettle quickly as a stable, reliable source of protein for troops. It was a fitting tie-in for Hormel Foods, given the role of founder George A. Hormel as a pioneer in veterans’ rights. Just a handful of years after establishing his enterprise, he made it possible for three of his employees to serve in the Spanish-American War, promising them full benefits and jobs upon their return. After the war ended, Thomas came to America, where he discovered – and no doubt tried – many varieties of his beloved SPAM® family of products. He returned to England to live out his fate: working in a SPAM® factory in Liverpool. Mark keeps the family tradition alive with his own daily SPAM® meal creations. (He has it on toast for breakfast each morning.) He never met a SPAM® recipe he didn’t like or prepare for Anne and their daughters, Evie and Milly. Mark even owns a SPAM® costume, which he dons for official SPAMbassador™ duties. As the two were getting ready to exchange vows, Anne thought of the best wedding gift ever. 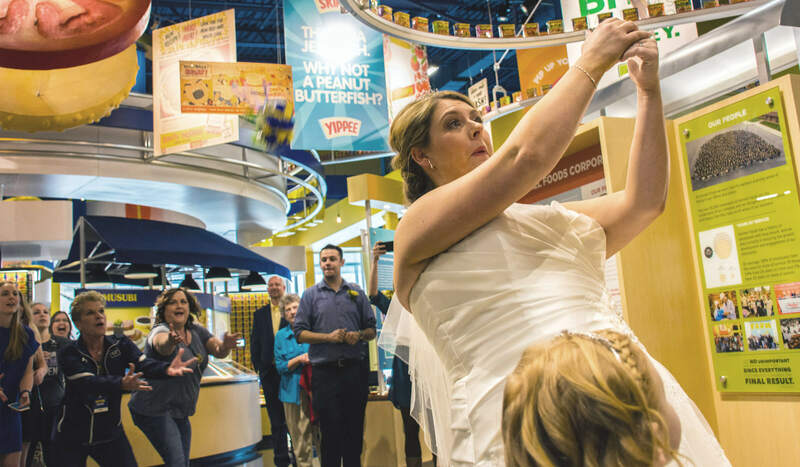 Knowing she wasn’t the only love in her fiancé’s life, she reached out to Hormel Foods surreptitiously and asked if the SPAM® Museum could serve as their wedding venue. “The museum isn’t set up for a wedding,” says Savile. But after learning of the family’s story and long history with the SPAM® brand, she was sold, as were Jaynee and other members of the brand management team. “It was a no-brainer. We set out to make it as much fun for him as humanly possible,” Savile adds. Can Central set up for the ‘I Love SPAM’ Benson wedding. 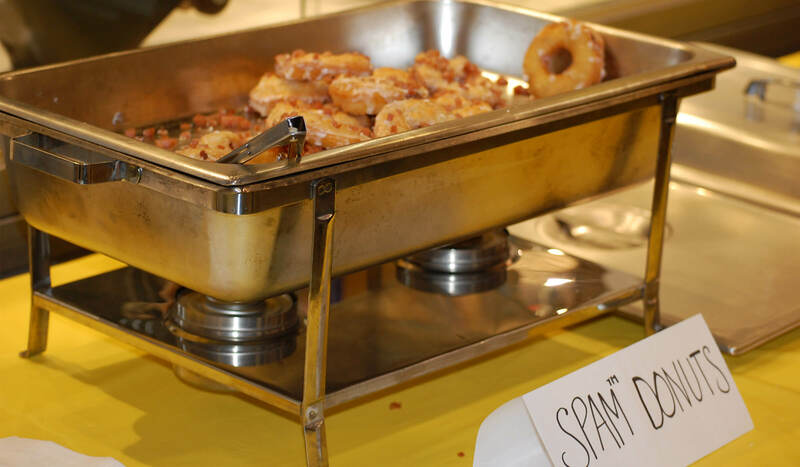 SPAM® donuts were served after the wedding. Jaynee Sherman joins Mark ‘I Love SPAM’ Benson, she is the senior SPAM® brand manager for Hormel Foods International and served the first ever SPAMinister™during the wedding. 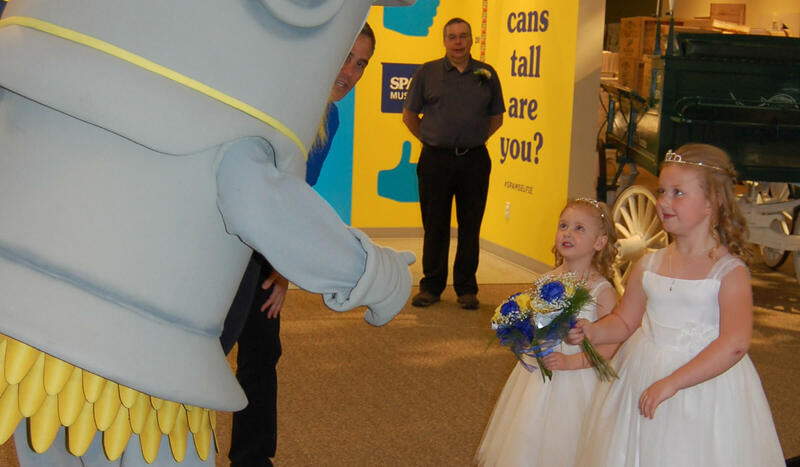 The SPAM® brand Sir Can-A-Lot® mascot joined in the festivities. Mark and Anne didn’t have a religious affiliation, and given that they were thousands of miles from home, didn’t know anyone who could do the honor. Members of the Hormel Foods brand team offered to help. What happened next is a blur for Jaynee. 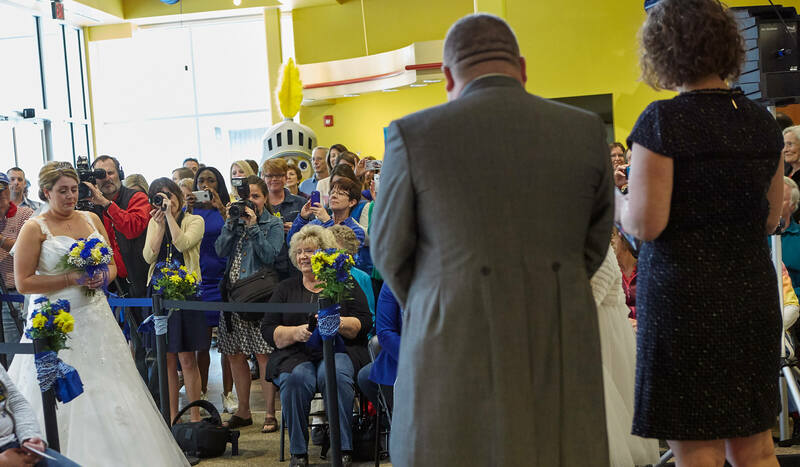 She doesn’t remember if she volunteered or was assigned, but before she knew it, she was getting officiating credentials online and preparing for a day that was as memorable for her as it was for the bride and groom. 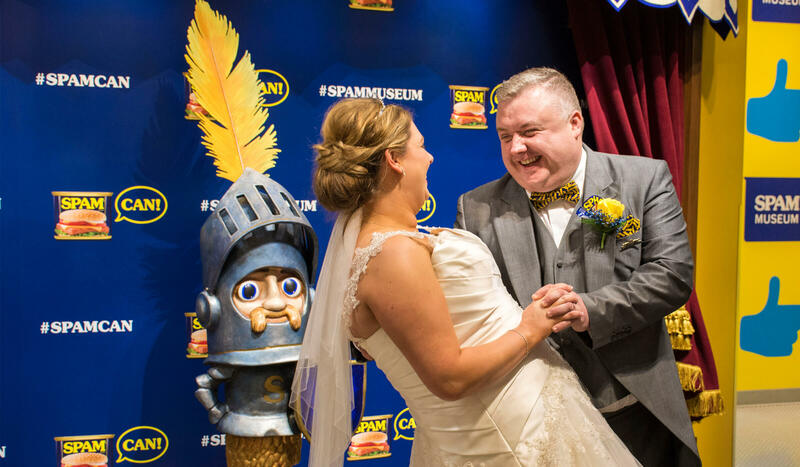 Will the family grow, so to speak, through more weddings at the SPAM® Museum? Jaynee and Savile insist not. But when Anne threw her bouquet, one of the museum gift-shop workers was the lucky recipient. “And she’s not married,” Savile laughs. “The SPAM® brand is about love. Love for our troops, love for our families, love for our friends,” she adds. A wedding, they both agree, is simply the icing on the SPAM® brand.